Whatever the application or industry, Basic offers a dependable and economical die cast component. Over 50 years of experience means thousands of die cast applications, analyzed, designed and produced. This long and varied experience is embodied in a stable organization which assures a steady and continuous service in production demands. 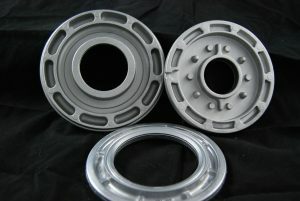 Basic has experience with performing many different finishing operations on its castings. “One Stop Shopping” is the goal of Basic’s product support. These finishing operations exist to allow Basic to ship parts that meet whatever requirements the end user may have. Depending on volume requirements, pricing or timing Basic may either out-source finishing requirements or create dedicated processing cells to complete the work in-house.